Leonardo has announced it has been awarded a contract by the UK Ministry of Defence to provide the Apache AH Mk.1 Attack Helicopter fleet with comprehensive support and maintenance services. The Apache Integrated Operational Support (IOS) contract is valued at approximately £293 million and will continue to support the Apache AH Mk.1 Attack Helicopter fleet from 1st April 2019 until the aircraft goes out of service in 2024. Under the contract, Apache IOS prime contractor Leonardo, through the involvement of its Helicopter and Electronics divisions, will continue to be supported by its industrial partners Boeing, Lockheed Martin and Longbow International to deliver complete spares provisioning, engineering, depth maintenance, repair & overhaul and technical support services for the UK MoD’s fleet of Apache AH Mk.1 helicopters. At Wattisham Airfield, the British Army’s main Apache AH Mk.1 operating base, Leonardo will continue to manage the Depth Support Unit and the associated workshops, ensuring the throughput of the facility matches the operational requirements of the Army Air Corps. At Army Aviation Centre Middle Wallop, Leonardo will continue to be responsible for the provision of Apache aircraft on the flight line at the School of Army Aviation, delivering the required number of flight hours to match the Army’s training requirements. 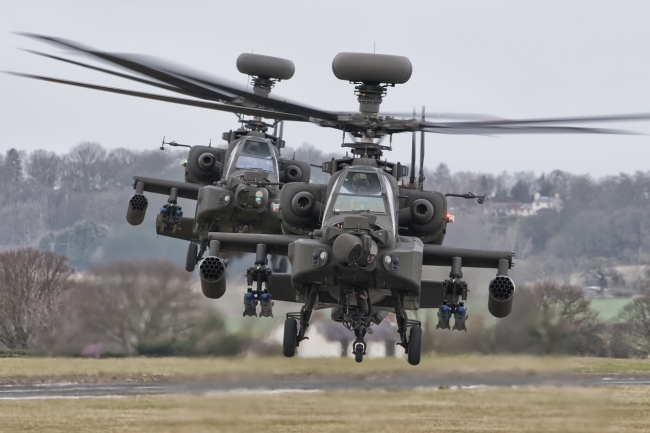 The Apache IOS programme office, manned by industry and Ministry of Defence staff, located at Leonardo’s Yeovil facility, will continue to manage the IOS contract.